Mr. Kitten made a disgusted sound and pointedly ruffled the bedsheets as if he were burying the human lying in them. Twitch yawn looked around. "Dude, what's going on?" "I am sending a message regarding our human’s laziness. She has been lying in bed with her iPad with Safari open to an Amazon page with cat strollers. For the last 16 hours." "Hmm." Twitch sniffed the human's face and patted her eyelid. "To be fair, she's been asleep for the last 14." Mr. Kitten arched his back. 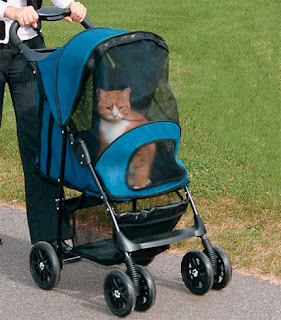 "You mean she hasn't been looking at cat strollers all this time?" He narrowed his eyes at the sleeping human. "My message to her would be more pointed indeed were I not declawed." "Yeah, well. Either way I don't think your message is getting through. She’s asleep like a rock." Twitch flopped back down and got comfortable. "For a while I thought she was dead. Can you snore and be dead at the same time?" "If anyone could, Chris Hugh could," Kitten huffed. "I woke her up a few times just to be sure she was okay. I'm kind of a hero that way. Plus I got myself some snuggles, cuddles and scritchins...So, what's your problem with sleeping and being lazy? You're a cat. Cat pride, remember? You need pride and I'm not lion. Get it? Lion, lyin'?" Twitch laughed, then yawned wide enough to show a fair portion of his alimentary canal. Mr. Kitten closed his eyes. "Puns are the lowest form of humor." "At least I have a sense of humor. What's got your fluffy knickers in a bunch?" Kitten sighed and snuggled down next to the sleeping human. "Oh, Twitch. 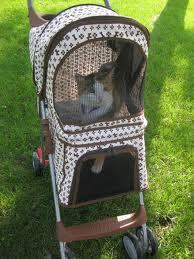 It's just that I'm so excited about her taking us out for a walk in a new cat stroller. I wish she would hurry up and order it." Twitch looked at him and nodded slowly. "Oh yeah. I'm excited about that too," he said, wondering at his friend's sudden love of the great outdoors. He snickered thinking about the time Kitten got locked outside. His fur was so puffed up with fear that the only way Chris recognized him was through the process of elimination, him being the only black, pissed-off cat with yellow eyes snarling outside the window that morning. The two cats settled down and went to sleep dreaming about being pushed around like kings in a luxurious new hundred-dollar stroller. 48 hours later, the three of them arrived home from their very first walk. Chris Hugh carefully closed the front door and opened the stroller. Mr. Kitten bolted out and dashed under the bed. Twitch hopped down, cast a dirty look in Kitten's direction and began grooming himself. And Chris Hugh spent an hour cleaning cat pee out of the stroller.